Often seen as cute, furry, harmless critters that only populate parks and trees, squirrels can actually put your home in danger. They find their way in through roof openings or small holes in walls, and it is important to be on the lookout for signs of their presence. The number one reason squirrels invade homes is to seek shelter from the dangers of the outdoors. Severe weather or predation can push them into our homes for protection, and expectant squirrel mothers often seek out a safe place to birth their young. If you find squirrels in your home, damages like ripped up attic insulation are common as they build nests and settle in. In addition to creating nests, they have to find a way to maintain their teeth that are constantly growing and do so by gnawing away at wooden structures in your attic which can lead to costly repairs. Even a small infestation can grow out of control quickly, as squirrels use pheromones to attract others to them. 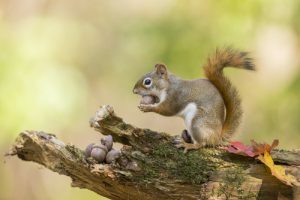 If you’re faced with a squirrel infestation, don’t attempt to handle it on your own, as they can spread dangerous disease and inflict injury. Call the experts at Critter Control® of Orlando. With over 30 years of experience, we can help ensure the safety of your home through efficient squirrel removal. Call us today at 407.295.7194.